The Truth Fellowship Live Cup [and wall decoration] – Designed by Artist Ralph Berg and Pastor Terry Kern. Written by Pastor Terry Kern and reprinted here by permission. This Symbol is beautifully conceived and represents beauty beyond description. It is a modern-day symbol of marvelous ancient truth. It should be understood to represent Jesus, The Christ – the Anointed One, the Messiah and the Glorious King of Kings and Lord of Lords. It is actually three separate symbols masterfully interwoven together to provide a distinctively beautiful symbol of Jesus, The Christ who is the fulfillment of everything Jewish and Christian. Neither Judaism nor Christianity would exist without Him. He is the 2nd member of the Triune Godhead and this tripartite symbol provides a visual reminder of great truths about Jesus, The Christ, the Son of the Living God. SPECIAL NOTE: It is important that it be said here that this is a “symbol”. It is NOT an “Icon” nor is it an “Idol”. Symbols are not worshipped but are visual representations that “POINT” our thoughts and attentions to the TRUTH that inspired the symbol. Symbols aid worship and are not in and of themselves anything. They serve as tools to enhance our worship. In this case this symbol is a reminder of the incredible, amazing, glorious and majestic person, Jesus, The Christ. The top symbol is that of a seven-branched menorah (Lampstand). “Menorah” is the Hebrew word for Lamp or Light. Many people are very confused by the Menorah. There are actually two Menorahs. One has seven “branches” and the other has nine. The one with nine branches is the “newer” version and it came into being following the Maccabean Revolt 10 years before Jesus was born in Bethlehem. The nine “branches” are the “modification” to the original Golden Lampstand in the Tabernacle/Temple Holy Place. The nine branches rather than the seven were created to commemorate the 8 days that the “one-day” flask of oil burned in the Rededication of the Temple in 165 BC by Judas Maccabeus. The Jews had miraculously overcome the superior armies of Antiochus IV Epiphanes (the Jews called him “Epimanes” which means “madman”) who had desecrated the Temple. Now the victorious Jews were cleansing and rededicating the Temple and there was only enough oil for ONE DAY but that oil miraculously burned lighting the Holy Place for the full eight days needed to rededicate it. But what of the “ninth” branch on the Hanukkah/Chanukkah menorah, you ask? A Jewish person who does not believe that Jesus is the Messiah cannot answer that question. 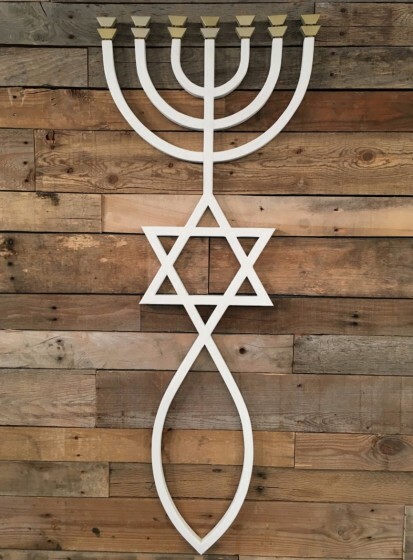 But Messianic Jews who light the Hanukkah candles every year will tell you that the “ninth” branch – the one in the middle – represents the MESSIAH – Yeshua HaMashiach. So, it is very fitting that the 7-Branch Lampstand is the symbol at the top of our tripartite visual representation of the Messiah. The base of the Lampstand is an equilateral triangle which is one of the two equilateral triangles that form the “Magen David” – the Star of David. This six-point star is an ancient symbol of royalty and has become associated with the nation of Israel – being chosen in 1948 to be the symbol – the only symbol – that would be on the Israeli flag. It should be noted that these two triangles are “equilateral” triangles – the length of each of the three sides is equal and all three angles in the triangle are equal. These two triangles are “interwoven” upon each other and this beautifully, masterfully depicts the TRIUNE GODHEAD – a plurality of persons of the Godhead. There is God, the Father, God, the Son, and God, the Holy Spirit. They are equally God – ONE GOD eternally existing in three persons. The Star of David beautifully depicts this glorious biblical truth. In addition to that truth is the truth that Jesus, The Christ is the SON OF DAVID. Isaiah 9:6-7 specifically promises that the “Messiah” will rule upon the THRONE OF DAVID forever. How the six-point star became connected to King David is somewhat unclear – BUT it clearly has been connected and Jesus, The Christ is the returning King of Kings and Lord of Lords who is the Son of David and who will take His place on the THRONE OF DAVID and “of His Kingdom there be NO END”! The bottom symbol in our tripartite symbol is distinctly Christian in origin. The other equilateral triangle of the Magen David (Star of David) is the tail of the fish. The Fish symbol arose in the early centuries of the Christian church. Shortly after Jesus arose from the grave, He ascended back into Heaven and is seated at the right hand of His Father there. But here on earth, His Church began to undergo severe waves of persecution. Many of His disciples were systematically murdered by Jews and Romans alike. Anyone who believed in Jesus was in danger of life and limb and the early Christians used to meet in caves (catacombs) and isolated fields and forests in order to avoid detection and death. They quickly developed codes as means of communication with one another. One of the most prominent symbols that emerged from the time of persecution is the “FISH” symbol (<><). The early Christians chose the Greek Word for fish (IXTHUS) as the coded means of identifying themselves to one another. The Greek word for “fish” was chosen because each letter of the word is the first letter of each word in a Greek phrase that beautifully describes the Messiah, Jesus, The Christ. The I(I) is the first letter in the Greek word for JESUS . The X is the first letter in the Greek word for Christ. The “TH” is the first letter in the Greek word for GOD. The U is the first letter in the Greek Word for Son. And the S is the first letter of the Greek word for SAVIOR. So, the Greek phrase is translated: “Jesus Christ, God’s Son, Savior”! It is actually a great but succinct theological statement concerning WHO JESUS IS. So, we chose this symbol to print on our TFL Cups [and wall] because it so beautifully reminds us of the glorious person of Jesus, The Christ who is the Son of the Living God. He will soon be returning to this earth and when He does He will take up His place as the King of Kings and Lord of Lords on the throne of David in His Messianic Kingdom. And He will remain on that THRONE FOREVER! No Replies to "The Tri-Une Symbol"